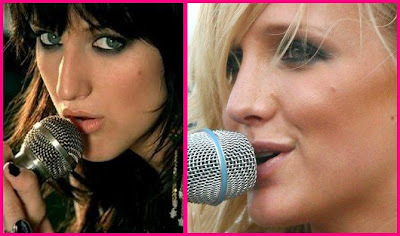 Here are a few before and after pictures of Ashlee Simpson after going under the knife for a nose job procedure, also known as rhinoplasty plastic surgery. I wonder how her fans feel about such an operation and the change in her natural appearance? We believe that Ms. Simpson looked exceptionally beautiful before her plastic surgery operation, however, many gossip blogs and tabloid press are heralding her nose job as "one of the best" in show business. As you can see from the before and after photos, the procedure smoothed out the arch on the bridge of her nose, giving it a more slim and pointy appearance. Her post-plastic surgery appearance bares a slight resemblance to fellow actress Drew Barrymore, someone who is also familiar with cosmetic surgery (breast reduction) rumors. Ashlee Simpson's nose job revelation has further sparked rumors of additional alterations of her face, including a chin reduction procedure which is purely speculation and in our humble opinion, we're not buying into it. There has also been some recent murmuring about Ms. Simpson possibly opting for a brow lift procedure to boot, instead we think this is largely attributed to her recent weight loss, causing a tightening of the skin effect. So, our final verdict on Ashlee Simpson's plastic surgery saga is... confirmed nose job (which she has happily admitted), and a double dose of false on the chin reduction and brow lift rumors. After seeing these before and after pictures, do you think Ashlee Simpson made a wise decision when she opted for her nose job operation? Let us know what you think in the comment section below! Other famous starlets who have also confessed to undergoing the knife for nose job plastic surgery include 'High School Musical' darling, Ashley Tisdale, and infamous 'Hills' reality star turned cosmetic enthusiast, Heidi Montag. I love her new nose!! very smart career move on her part. she looks much more appealing. She is just 25 Now..how can she think of plastic surgery at 23..these celebrity are crazy to go under knife..i browsed one blog with her Nose Job before and after Pictures..check it out..
Before she looked unique, now she looks like all the other plastic dolls.